Running concurrent with our most popular workshop, “From the Ground Up with Cob,” we are excited to be able to offer “Kids Cob Camp,” once again this summer. Relax and enjoy your learning experience as you discover how to build your own home with earth, including hands on experience building foundation, cob walls, sculpting furniture, natural and lime plasters, and so much more. Your child or children will be fully engaged in a Cob Camp of their own with our Youth Director leading the way. The biggest problem we have is keeping the adults focused on the main project, as the Kids Camp lures them away with laughter, the creative process, and the kids working on their very own cob project. This fabulous program for children 3 to 11 includes a wide variety of age appropriate activities, including the kids working on their own cob project, and unrelated to cob, super fun stuff as well. It is truly a cob camp for kids that they will never forget! 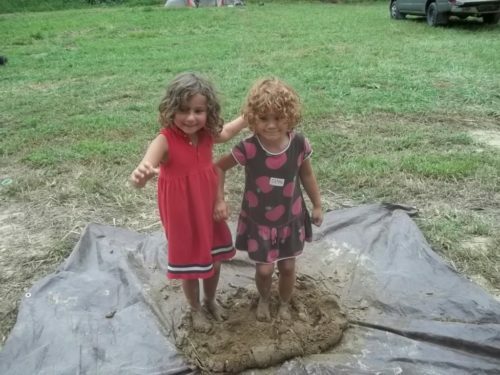 Registration for the kids program includes the costs of the facilitator, materials for crafts, etc., and of course meals, snacks and camping. We start each day with breakfast with our families. Then the children join the Youth Director for an activity packed morning and rejoin their family for lunch at 12:00. Back to play and work until 4:00, when families attending with children get first dibs on the shower. We suggest out of town guests, as well as local folks, to arrive the night before to set up camp. We will eat three meals a day together every day for each day of the workshop.